We are pleased to be able to offer you a complete service from initial design to final coat of paint, and on into the next 10 years with our warranty*. Our hopes and aims are that you will find our level of professionalism and customer support second to none. Not only will we design your own bespoke garden room, but we also have trained, experienced staff to install the foundations, construct the building and connect to mains electricity. If you are considering an annex with a kitchen and bathroom, the plumbing and tiling will also be done by our team, so no unknown contractors. * We offer a 10-year warranty on our new builds, but in most cases this is not possible with the refurbishment of old buildings. Foundations are of paramount importance and cannot be compromised, so unlike many companies we construct them ourselves so you don’t have the inconvenience of finding outside contractors. This also means we take responsibility for their long-term strength and stability, and the longevity of your Garden Room. 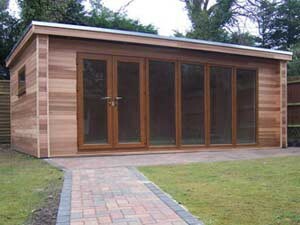 Like most other garden room companies, we build and deliver our buildings in modular form. By pre-constructing the building in our South Oxfordshire workshop we know that we will have a quick and trouble free construction. Modular panels are fixed firmly together with specialist fixings to form thick, well insulated walls 172mm thick. We use only top quality materials, and all timber meets British Standard grade C14-24. To ensure protection from dampness and moisture the outside of each wall is clad with a waterproof membrane which gives lifelong protection. Roof structure is a very important part of any building and what separates us from many of our competitors. We build our roofs to the same design and standard as a residential house. We use thick timber joists or rafters with high levels of insulation and an air gap to prevent condensation. This not only ensures the roof and building has a long, maintenance free life, but with high levels of insulation packed between each timber, year-round comfortable use regardless of weather. 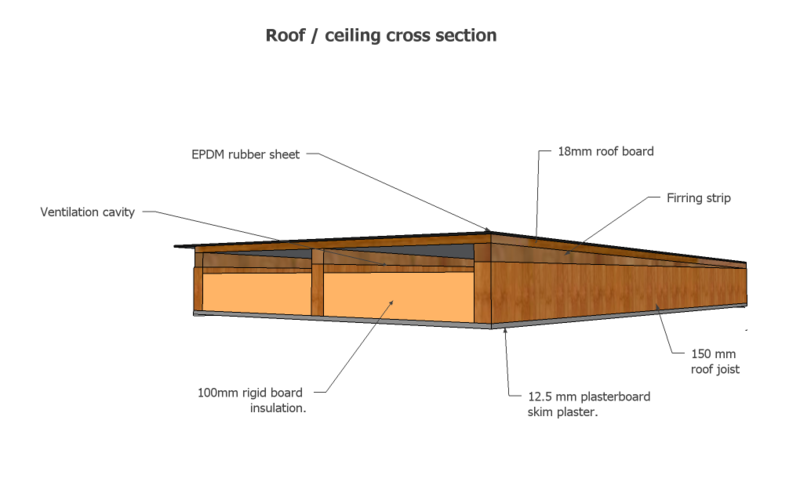 The sketch below shows the standard construction of one of our flat roofs. We regularly upgrade from 100mm thickness of insulation to 150mm if building regulations are required or the client requests extra levels of insulation. This is contrary to many other companies who offer a less expensive Composite Roof Board. This is a layer of insulation sandwiched between two sheets of tin, which although much cheaper, has many disadvantages effecting the longevity and comfort of the Garden Room. 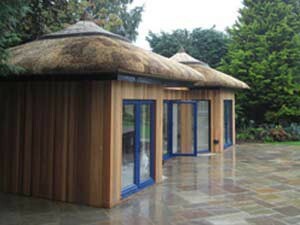 In most cases we clad the exterior walls with 18mm thick Western Red Cedar tongue and groove board. This is a very popular timber, often chosen by architects for its attractive look, low maintenance and very long-life span. However, it has become increasingly expensive so we now offer other forms of cladding such as Thermowood or treated larch. 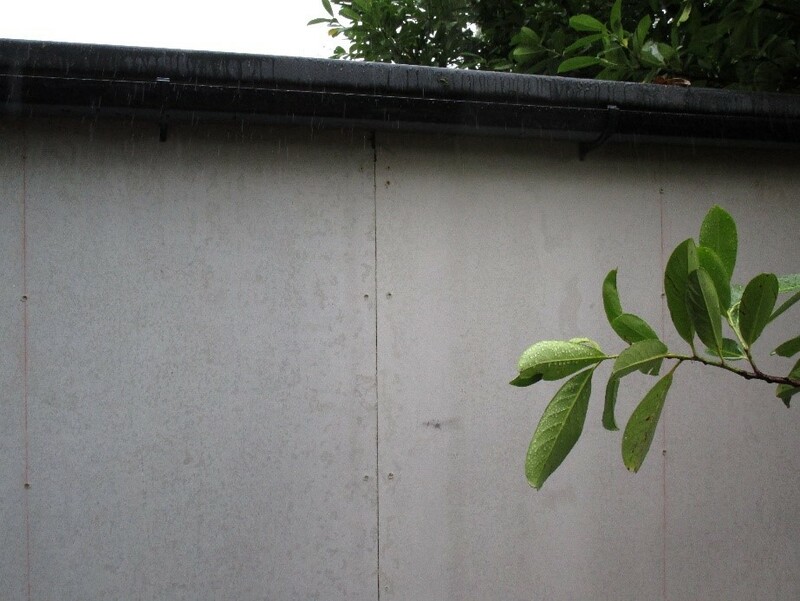 For walls that are built close to your garden boundary, we use a fibre cement board. This is an excellent product with extremely low maintenance and a very long life span so we can build very close to fences without requiring an access gap for maintenance. Where gardens are small and space valuable this prevents the unnecessary loss of garden. Fibre Cement Board is shown in its natural state in the following photo. It can be painted if required. Black seems to make it disappear when seen from your neighbour’s property, or we can clad it with a trellis to allow climbing plants to grow over it. We offer a whole range of doors and windows to suit your needs and building design. UPVc and Powder Coated Aluminium are the most popular but occasionally we fit wooden joinery. Whichever you want, and whatever the style of window or door, they are excellent quality with multi-point locking systems to ensure your garden room is as secure as your house. We have designed and built garden rooms for every type of use, and our largest buildings are often used as annexes, with kitchen, bathroom and bedrooms. In most cases we can design to meet Permitted Development requirements, so not requiring planning permission. Building regulations do not have to be met if the building is under 30msq, but if you want a larger building, such as one of our annexes, we have no trouble working to the required standards. We know all the design tricks to improve the building especially for your intended use. We have built artists studios requiring a lot of natural light; recording studios with high levels of acoustic insulation; offices with high-tech IT installations; music rooms with floors strong enough to support grand pianos and roofs strong enough to support a heavy Green Living Roof. Our advice is always to build plenty of flexibility into your design. What is a gym today may well become a reading room in 10 years’ time! From the time you place your order, we can normally supply within six weeks, but possibly as quickly as three. Depending on the size of your building, installation takes from three weeks. 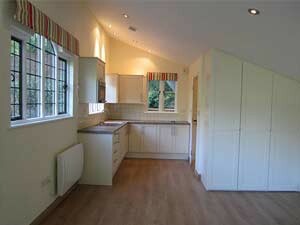 Larger annexes with bathroom and kitchen facilities can take as long as 12 weeks. Still not bad for a small house! Don’t worry if you have limited access to your garden. All our buildings arrive as flat panels that are carried by hand, so as a general rule, if you can get a wheelbarrow into your garden we can get our buildings there as well. If you have no side access, in most cases we can take them through your house. Dustsheets on floors, of course! There will usually be a team of two, but sometimes more. Before arriving they will have built your Garden Room in our workshop, so they already know it inside out! They will be with you from start to finish, and will be responsible for the whole project. Plastering and electrical work needs specialist tradespeople and we have a pool of them to call upon depending on availability and location. Except for a few cases we will have used them before and will know their standards of work and finish is as high as our. Let us help you discover the potential in your home.